You all, I have been about to BURST with excitement in keeping this secret from you! Two years ago (back in November of 2009), I wrote a post entitled “Homecreators Conference” where I dreamed a little dream and started asking “what if….”. Under the leadership of some amazing bloggers, I am beyond ecstatic to see that dream coming true! Ack! So how about you? Have you dreamed about a blog conference just for the DIY/Home niche? Have you ever wanted to have your favorite bloggers teach you how to re-finish furniture? Take the perfect photo? Stage a room? Have you ever wanted a conference that offers hands-on training from some of the best of the best? Well dream no more! Some of your favorite home bloggers are teaming up to bring you a fabulous DIY/home blogger conference and it will be the must-attend event of the year. 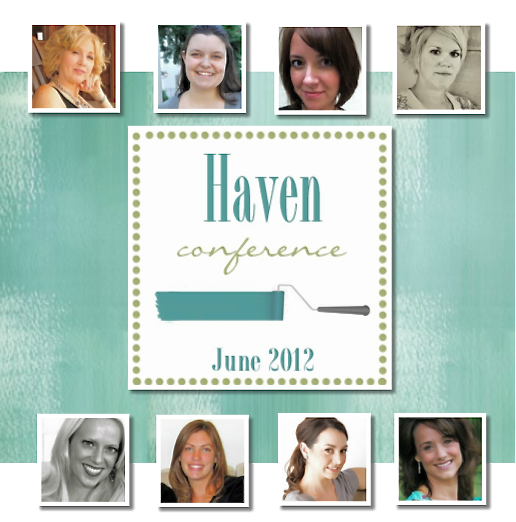 Go ahead and visit the Haven website for more details and prepare to be inspired! It’s going to be goooooood! BETH!!! This is SO EXCITING!! I so wish I could be there. Can’t wait to read all about it. I’m so happy for you that your dream is coming true!! This sounds like such a fun idea! I’m really excited about it and will be back August 15th to check out the tickets. I’m saving the date! I already commented on this, but I was wondering if you know exactly when tickets will go on sale? I’ll be driving across the country on the 15th, and wouldn’t want to miss the opportunity to sign up. I can try to stop somewhere if I know what time they go on sale. Thanks, Beth! Exciting stuff! You guys should create an e-mail list so you can notify people who are interested when tickets go on sale and the schedule is finalized. Look forward to hearing more about it! Wow, that’s so exciting! Hope I can make it! I am so excited about this! I am a huge fan of everyone on the team, can’t wait to meet y’all, and even more exciting – it’s a meet up on this side of the country! Yay! Just right down the road from SC! I’ll be one of the first to purchase! Thank you so much! Yay! That’s not too far from me! I am looking forward to it!! woo to the hoo!! 🙂 Can’t wait to finally meet you and so many other bloggers and hug some necks! I’ll help spread the word! I am all over it! I remember you talking about this and what a great experience it will be for everyone involved! What away to see a dream come true! Oh, I’m so excited. I was looking for a conference to go to next year and this will be perfect!!! I’m so in!! Congratulations! What an honor and accomplishment, Beth! I heard a little whisper about this and I am so excited!! posting the button on my blog right now! I remember last year when we talked about this. I am so glad you are making your wish come true. What a great line up of girls and I know the talent will be overflowing. I will make sure to save the date.